Cleric Beast (聖職者の獣 Seishoku-sha no kemono lit. 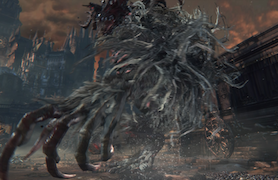 "Cleric Beast") is a Boss in Bloodborne. While optional, it's likely the first boss that most new players encounter. 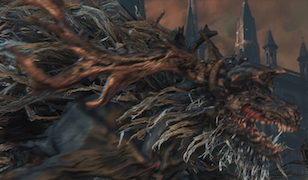 The Cleric Beast is an enormous creature with disfigured horns. With high agility and superhuman strength, this boss should not be taken lightly. This creature owes its name to a rumor which states that members of the Healing Church would eventually transform into the most hideous beasts. You can summon Father Gascoigne to help you fight the Cleric Beast (you must have the Old Hunter Bell). 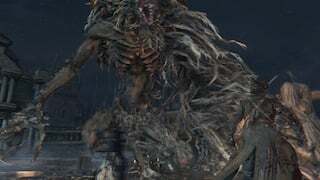 He can be summoned near the fountain where you encounter the first Brick Troll in Yharnam. The advantage to summoning Father Gascoigne is that he can help you fight the enemies that guard the Great Bridge. The disadvantage is that he may get hurt before the boss fight against the Cleric Beast. It's your choice when to summon him, but people who have issues reaching the boss may want to consider summoning him before fighting the enemies on the Great Bridge. You can also summon Vileblood Hunter Alfred at the door of the dark house that leads back to the Centarl Yharnam lamp after you have killed the Blood-Starved Beast before fighting the Cleric Beast. The Cleric Beast is an optional boss fight, but is necessary to beat if you wish to acquire the Sword Hunter Badge. You gain 1 Insight for finding the boss and 3 Insight for killing it. 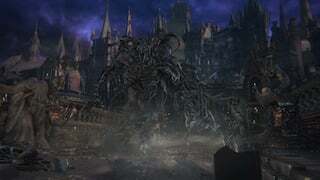 Central Yharnam at the far end of the great bridge. You will have to fight several enemies to reach it, including a pair of Wolf Beasts; Carrion Crows; and a Brick Troll. It's possible to avoid fighting the Wolf Beasts if you take a shortcut from one of the houses. Blood Echoes: NG (4,000), NG+ (61,812), NG++ (67,994), NG+3 (77,265), NG+5 (92,718), NG+6 (154,530), NG+7 (265,173). The Cleric Beast is vulnerable to Serration and Fire damage, and can be crippled in the fight for a short time. However, it's considerably strong against Blunt, Arcane and Bolt damage. Always try to dodge and stay behind him, since his counterattack swipe with his left arm does minimal damage that can easily be recovered via the Rally mechanic. Attacking any of its limbs repeatedly will eventually cripple and stagger the Cleric Beast for a short while. After a certain amount of damage is dealt, it will start doing its healing animation with the red aura. This will heal all of its crippled limbs and will enrage it further. It will not, however, heal back any of its health. You can shoot his head with a firearm to open him up for a visceral attack, which will cause massive damage. When using the Hunter Pistol it takes two direct hits usually (on NG). On the flip side, the Hunter Blunderbuss takes three normally (also on NG). At extremely close range, only one is sometimes needed (NG). If you have successfully pulled off a Visceral Attack by shooting its head, you can do it again only after it uses its healing move to regenerate limbs. Molotov Cocktails are extremely effective in this fight. They usually hit for around 250 damage since they deal fire damage. Don't forget to use Oil Urns to further increase the damage. You'll find a small handful near the fountain where you can summon Father Gascoigne; it's guarded by a group of Carrion Crows. However, keep in the mind the Cleric Beast's agility; it can easily jump and dodge both items if you carelessly throw at it. If you summoned Father Gascoigne into the fight with you, the Cleric Beast will largely ignore you; Father Gascoigne is so aggressive, he'll just stand in front of the beast and attack wildly. He doesn't do a great amount of damage with each hit, but it leaves you relatively unhindered to get behind the boss and break its legs. 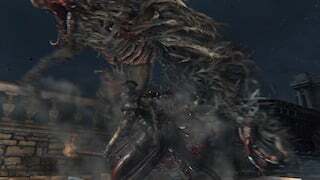 Furthermore, like his boss fight encounter, Father Gascoigne will transform his axe to extend it when his health is low, allowing him to hit the Cleric Beast from a longer distance while still being able to use his unique firearm. Father Gascoigne does not fill a summon slot. If he is summoned first, it is still possible to summon two players, allowing you to tackle this boss with a four-man team. If you have already killed Blood Starved Beast in Old Yarhnam , you can summon Alfred for this fight. You can take a stairs from Central Yarhnam lamp , kill the Huntsman & you will find messagers ringing bell before entering the dark room which is short to Cleric Beast. Grab This enemy has a grab that can be deadly, if you see its left arm swing forward in a grappling motion, get out of the way. 4-hit combo Wait away from the boss until the last hit slams the floor to safely counter. Forward Leap Roll INTO the leap to avoid taking damage. Forward Slam Stay away to avoid, or roll forward to avoid taking damage. 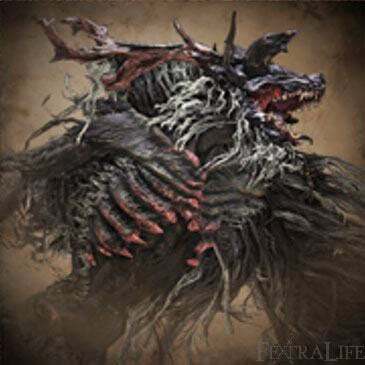 The Cleric Beast's design appears to be inspired by the legend of a supernatural creature known as a "wendigo." The legend of the wendigo states that it grew in size depending on how many humans it had eaten. Since Brador wears the skin of a Cleric Beast, yet it's small enough for Brador to comfortably wear as clothing, that might mean that Cleric Beasts start off small at first. Even more chilling, if this is true, that means this particular Cleric Beast you fight on the Great Bridge has eaten many humans and thus grew to an enormous size. Its horns, which are very misshapen, are a trademark of this particular creature. The music score of the Cleric Beast fight is the same as the one used for the "Project Beast" trailer, albeit with minor modifications. At the beginning of the game, when you climb the ladder that leads to Gilbert, you hear an unknown creature screeching loudly throughout the city. This is a foreshadow to new players, warning them of terrible things that lurk in the city. In this case, the loud screech belongs to the Cleric Beast, who continues to screech loudly while it tries to kill you. In the Bloodborne trailer, "Face Your Fears," the Hunter is crushed by the hand of a creature that looks similar to the Cleric Beast. 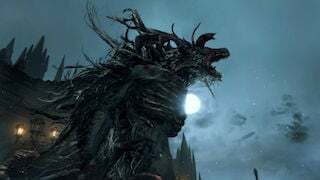 The Cleric Beast shares similar characteristics to Manus, Father of the Abyss from Dark Souls; they both have red eyes on their horns and their left arm is larger than their right. The fur on his legs looks unusually like fungus and there are nails jammed into his legs. Can someone tell me how he is optional because the main gate requiring the emblem, is the only way I know how to get to Vicar Amelia and progress through the game. I was able to summon Alfred for this fight without defeating the Blood Starved Beast. His summoning bell seems to appear there after you talked to him at the Logarius statue and decide to cooperate with him, like the one in Old Yharnam. In case you wonder what this "blood sucking effect" is, it restores the armor. You know how in the Hunter&apos;s Nightmare we come across another vicar praying at the elevator to the Research Hall, and off to the side is a church hunter dressed in black? That&apos;s how I interpret the relation between Vicar Amelia and the Cleric Beast. 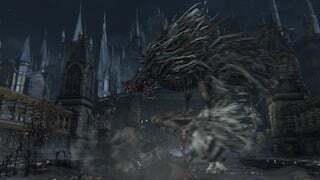 The Cleric Beast is a sort of bodyguard for Vicar Amelia and kills anyone that tries to enter the Cathedral Ward from the Great Bridge, while Amelia continues to pray at the Grand Cathedral. It isn&apos;t the exact same hunter as we meet in the Hunter&apos;s Nightmare, but an occupational successor. This would also explain why it drops the Sword Hunter badge (although the fact that it is apparently a cleric is reason enough). That beast is Vicar Amelia, not the Cleric Beast. Is it just me, or does CB resemble Manus from Dark Souls? Dash and hit fight, quite easy if you attach him from his back. "red eyes on its horns" in proper lighting, specifically when the sun lowers after fighting Gascoigne, it&apos;s easier to see that those aren&apos;t eyes, but the broken ends of the horns themselves. 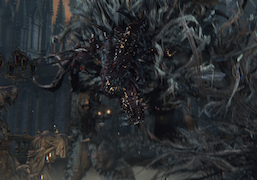 Cleric beast doesn&apos;t appear to have eyes whatsoever. I killed this with no problem on my first try. Go all the way to the ither side of the bridge, chuck cocktails, and go for a visceral on his head while he&apos;s down. 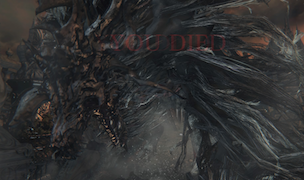 Can&apos;t remember who but some *****ing retard said that the Cleric Beast was Ludwig. You know, it&apos;s *****ing proven he&apos;s not in Old Hunters. After being told that Ludwig wasn&apos;t Cleric Beast he then jumped to another theory saying that Brador was Ludwig. Guy was a *****ing retard. You might find him down there in the comment section somewhere. can u parry this thing? Call me a pleb or something but, isnt the clearic beast look a lot like Manus, father of the Abysss??? I created a new character yesterday after the update, and noticed in two attempts that I could only get the stun from shooting his head once, whereas before I could get it 3 times. I waited for his red glowing indicator and all that, and wasted about 15 Pistol shots to his head trying to get that second stagger, to no avail. Has anyone noticed anything similar? God the noises he makes just adds to the horrificness of the thing. Killed him yesterday in NG+, started off the fight by blasting him once with a buffed cannon (+7 and bonemarrow ash), took out about 690 health and stunned him, allowing for a visceral attack right off the bat. So you can infact stun him for a visceral. I also had 99 insight at the time.